After a few minutes, the girls move on to try hanging from a trapeze while another group comes over to try and launch themselves from the trampoline. Circus equipment is placed all around one end of the vast space that once housed a section of the Roebling Wireworks during Trenton’s industrial heyday. Light streams in from the arched windows, and the doors are left open to let in the fresh air on this early spring day. 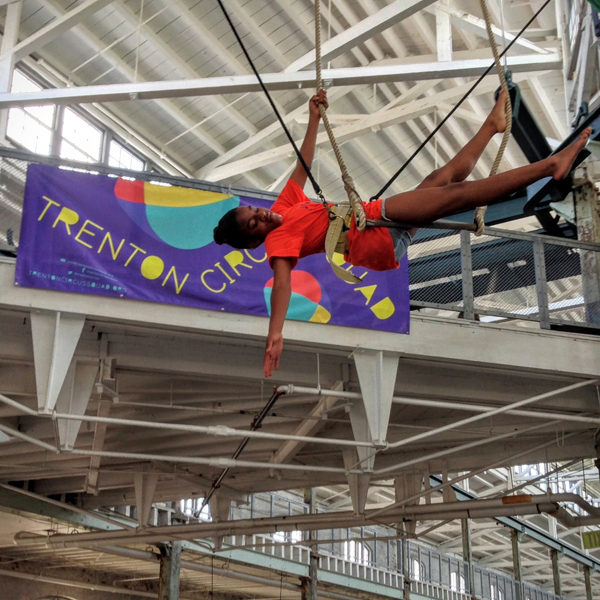 Discovering the power, discipline, and freedom that circus skills provide is the basis of the Trenton Circus Squad, which has exceeded expectations in less than a year of existence. Brookes and program director Thomas von Oehsen have partnered with such agencies as the Boys & Girls Club of Trenton, the Catholic Youth Organization, Anchor House, Mercer House, Urban Promise, Homefront, PEI Kids, Mill Hill Child and Family Development Center, and PSE&G Children’s Specialized Hospital to create this program geared to at-risk, hard-to-reach youth from inner city Trenton and surrounding communities. The idea is to foster understanding and diversity by pairing children from different backgrounds. So the participants from underserved urban families might learn how to ride a unicycle or walk on stilts alongside those from less challenging circumstances. Kids who live in a homeless shelter can be mastering juggling or slapstick with students from the prestigious Lawrenceville School. All of this takes mutual trust. Brookes and von Oehsen discovered a shared interest in youth circus eight years ago after being connected by a mutual friend. Brookes, a trained engineer, was the chief operating officer of Isles, the Trenton community development agency. She got hooked after getting her three children involved in a community circus in Connecticut. Later, she ran the Stone Soup Circus program in Princeton. Von Oehsen, who had attended clown college after graduating from Princeton Day School and taking a gap year at Lawrenceville, was administrative director of Princeton Academy of the Sacred Heart for 15 years. While there, he ran a circus program. 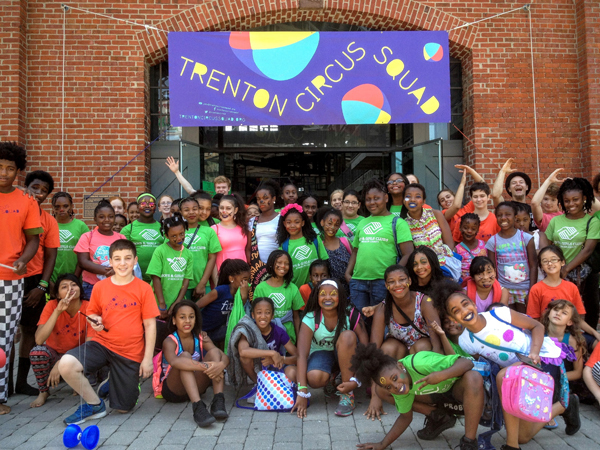 After spending a year raising funds, they started the Trenton Circus Squad last summer with about $240,000 in private donations. Their initial program included 21 workshops for 900 young people from the Trenton area. In addition to the agencies they contacted, the partners got recommendations from social workers and local police officers of particular kids whom the program might beneit. The program’s focus is a core squad, aged 12 to 17. Once they master certain techniques, these kids teach youngsters aged six and up how to perform different circus skills. “Half the youth are from Trenton, typically with low incomes, and half come from elsewhere,” van Oehsen says. “About 20 percent come because a social worker or police officer said it would be good for them. About 30 to 50 percent were told about us by a friend. We recruit from the schools. We have connections with social services. And there are the neighborhood kids who might ride by on their bikes and look in, and we invite them in. We’ve had a lot of walk-ins, and that’s been really cool.” Amanda Franklin, a case manager for Mercer House Youth Shelter, has witnessed positive change in the children she brings to the program each week. Another originally reluctant participant provides one of the program’s success stories. Trenton resident Kordell Garland, 16, kept his head down at first. But in only a few months, he has become an enthusiastic mentor of other kids, while perfecting his own natural physical ability. He now attends a special drama program at New York University’s Tisch School of the Arts on Saturdays. “I get to meet new kids,” he says. “There’s lots of improvising. I’m learning to become a better dancer, and I’m getting better at acrobatic skills.” Tom Florek is a volunteer for Anchor House, the Trenton sanctuary for homeless and runaway teens. He has been bringing kids to the program once a week. Florek was doubtful, at first, that they would be interested. But a funny thing happened. The famed circus company Cirque du Soleil uses circus arts as a tool for youth development. “So it’s not new,” Brookes says. “But it had been relatively ignored in America. 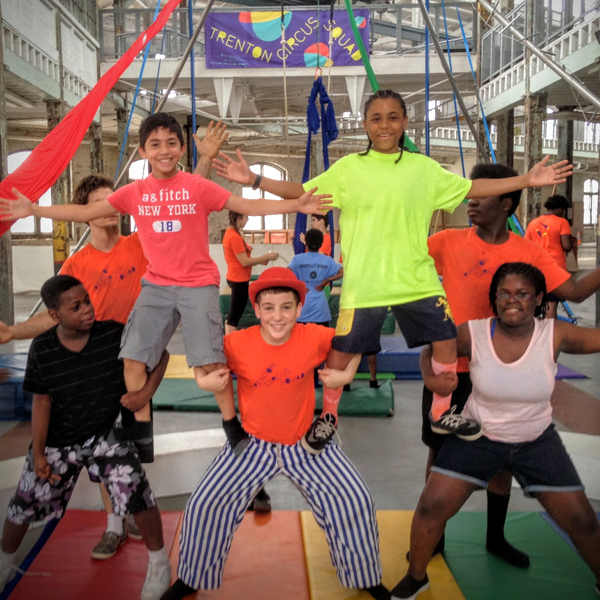 There is now a network of 17 circus programs around the country.” Last summer, 13 members of the squad attended the American Youth Circus Festival in Portland, Maine, sharing their new skills with participants from some 200 schools teaching circus.